I’m beginning to think that, although our dog Charlie has been blessed with a super-powered Beagle nose, perhaps he didn’t get a great deal of Beagle brains. I’d like to believe he’s the smartest dog around, but it’s getting harder to ignore the mounting evidence that indicates otherwise. It started shortly after we adopted Charlie. For weeks we tried to convince him that the things he kept digging out of the cat’s litter box were not, in fact, gravel-coated candy bars. I was disgusted and had to fashion a hiding spot for the litter box so Charlie wouldn’t use it like a snack bar. There are also times I find Charlie happily chewing on his own back leg, as if it’s a toy and not actually connected to his body. To prevent him from gnawing it off, I give him and his backyard companion E.J. rawhide chew sticks. Charlie happily takes his chew stick and trots off with it. But when he notices E.J. getting a chew stick, too, suddenly he doesn’t want his stick anymore. He wants E.J.’s stick, and he wants it bad. So he drops his own stick and circles around E.J., nudging and bumping him until he pries it from his jaws, at which point Charlie snatches it and sprints to the other side of the yard in victory. Because E.J. is much older and wiser and has no energy for puppy shenanigans, he doesn’t object to having his chew stick snatched. He simply picks up the perfectly good chew stick Charlie abandoned and then he lumbers away to eat it in peace. The Beagle is convinced that a stolen chew stick is the superior one, even though they are exactly the same. Our Beagle is also confused about when he is and isn’t needed for guard-dog duties. He barks – a lot. The new neighbors on either side of our house probably wish we’d move to Alaska. Charlie barks at squirrels, moles, birds, lawn mowers, rustling leaves, moving clouds, neighbors who go for a walk, neighbors who check the mailbox and neighbors who come within 200 yards of the wrought-iron fence where he stands watch. I’ve tried teaching him that not everything that moves is a threat, but he doesn’t seem to hear me. He’s too busy barking. So at night, we let him sleep on an enclosed back porch so he won’t bark and wake the neighbors. Once inside, he typically settles down on a blanket next to E.J. and they snooze peacefully until daybreak. But one night last week, at around 3 a.m. Charlie launched a full-scale barking assault on the back porch. I assumed he’d spotted a raccoon or a mole out the window and would settle down once it disappeared from view. But he kept on barking despite all my shushing and finger-pointing. 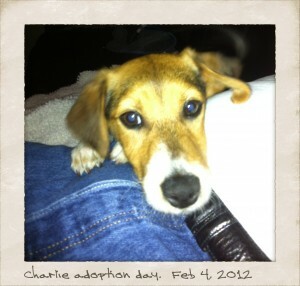 When we brought Charlie home, we asked a dog trainer to help us civilize him and she did a great job. He learned to sit, stay, and he can even shake hands on command. It’s very cute. But now what I really need is a lesson on how to make Charlie shut up.